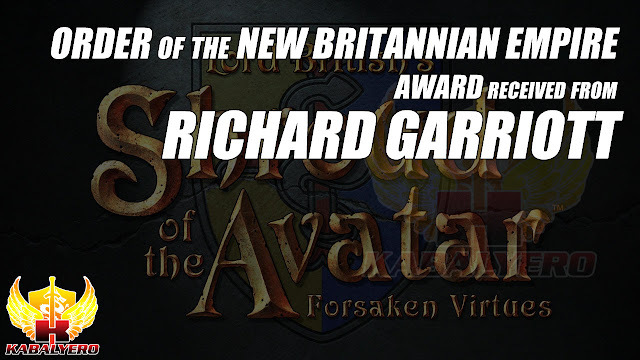 Order Of New Britannian Empire Award Received From Richard Garriott And Shroud Of The Avatar - KABALYERO - PLAY, BLOG & EARN! During the Summer 2017 Telethon of the Avatar Part 1 that happened last May 31, 2017, I was one of the few lucky recipient of the Order Of The New Britannian Empire Award from Lord British himself, Richard Garriott. I made a very brief appearance to acknowledge the award and, of course, to say Thank You to Richard Garriott and to the entire Portalarium team. It was truly a great honor to receive such an amazing award from a Living Legend. Today, I received a notice from our Local City Post Office about a package from the US. I immediately went to the Post Office to claim the package and, after paying the Custom Fees and signing a form, I got the package and it was from Portalarium. At home, I immediately opened the small package and inside I found my Order of the New Britannian Empire Medal that was awarded to me by Richard Garriott less than a month ago. Again, I would like to thank Richard Garriott and everyone in Portalarium for this great honor. Thank you, thank you, thank you.